The study day was planned to coincide with the National Trust's centenary celebration of the Representation of the People Act (1918), which granted all men over 21 and women over 30 the right to vote in parliamentary elections, subject to certain qualifications. 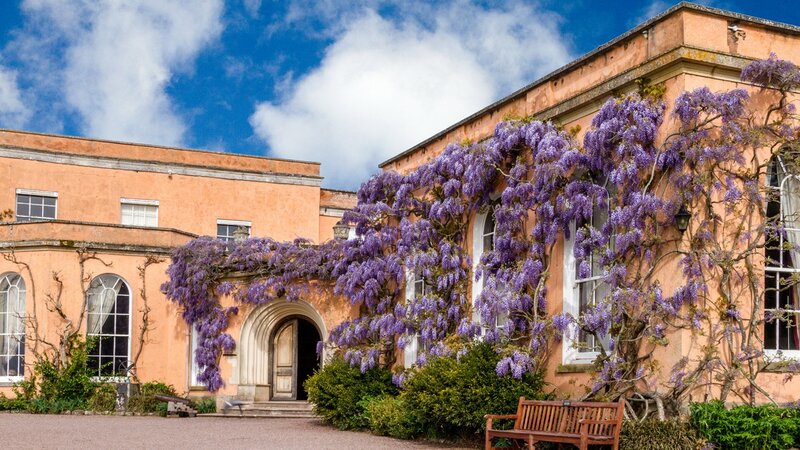 Killerton House currently has three exhibitions on display linked to the National Trust's Women and Power national programme. The house exhibition ‘Votes for Women?’ tells the story of two of the Acland women of Killerton who were on opposing sides of the suffrage debate. The National Portrait Gallery's touring exhibition ‘Faces for Change: Votes for Women’ explores the fight for female suffrage through paintings and photographs, on display until the 31st October. Upstairs there is the fashion exhibition ‘Branded: Fashion, Femininity and the Right to Vote’ showcasing how women’s dress has evolved and been politicised since the late 19th century. The theme of the study day was dress and politics and the day began with three talks broadly linked. Professor Angela K. Smith from the University of Plymouth started the day by giving us an introduction to WWI and the suffrage movement in her talk 'What Difference Did the War Make? The Campaign for Women's Suffrage and the First World War’. The talk tracked the history of the suffrage movement and examined how the war impacted and changed the campaign. Smith began by introducing the idea that there are many opposing arguments on the war’s impact - whilst many believe that WWI was instrumental in winning the vote, others think that the vote was practically won by 1914 and only put off as a courtesy until the war finished. Professor Smith then discussed the trajectory of the Women’s Suffrage movement up until 1914. She of course mentioned the Women’s Social and Political Union (WSPU), founded by Emmeline Pankhurst in 1903 as an all-female suffrage advocacy union dedicated to ‘deeds, not words’. In its first few years the WSPU gained a reputation for civil disorder and as a major threat to the public. However, Smith made the point that what really made the WSPU dangerous was its efficiency and dedication to bureaucracy, which made the suffrage campaign incredibly well-organised, whilst also providing women with the experience of working in leadership roles that they would have otherwise been denied. However, the WSPU was not the only society campaigning towards women’s suffrage and by 1914 there were a multitude of groups with somewhat fragmented relationships to one another. Their ultimate aim was to gain the vote, that was agreed, but the conflicting socio-political views of each society divided groups, making the movement as a whole diverse in opinion and campaign methods. By 1914 the term ‘suffrage’ was used as more of an umbrella term for lots of different societies rather than one unified movement. Smith then went on to examine the effects of the war on the campaign itself. When war was declared, many societies formally withdrew from political activism (which had a knock-on effect of others taking their activism underground) to focus on the war effort. The WSPU in particular saw the war as a way to shift their campaign strategies by aligning itself with the government and declaring absolute support to Britain. Smith rounded off the lecture by discussing the actual conditions under which women got the vote. In 1918, suffrage was accepted with the caveat of an age limit, meaning in reality only 8 million women were granted the right to vote, and were thus still the minority. A bittersweet ending, but Smith emphasised the valuable work women undertook in WWI and concluded that this left a lasting social and political impact on Britain. Dr. Becky Munford, Reader in English Literature at the University of Cardiff, then introduced us to the 'Women in Trousers' visual archive that she is working on with the universities' library in her talk 'Not in Those Trousers:Visualising Women and Power’. The talk took the cultural idea of trousers as a starting point, then looked at women in trousers as an act of political activism, and ended by exploring how Munford’s archive documents unseen women’s history. Munford started by introducing the idea that trousers have a shifting and unstable meaning, especially when worn by women. Trousers were traditionally associated with ideas of masculinity and civilisation, and symbolised a world women did not have access to in the eighteenth and nineteenth centuries. Thus, when women began to wear trousers (a symbol of male authority) in the mid-nineteenth century, a complex was constructed in which the wearer confuses the signifier. In short, when women began wearing ‘masculine’ garments, the idea of the trouser as an inherently male garment (and in turn, gender roles) became troubled. The Bloomer Costume rose to popularity in the mid 1800s. It consisted of what were known as ‘turkish trousers’, and a smock-like upper half. The costume was popularised, unsurprisingly, by Amelia Bloomer who wrote a series of articles in The Lily, a ‘a ladies' journal devoted to temperance and literature’ from 1851 onwards, advocating for the new style of dress. Bloomer argued that the divided garment permitted extra mobility and was a more healthful mode of dress. When the style took off in the summer of 1851 in London, the press dubbed the costume and its wearers ‘Bloomers’. However, not everyone was a fan of the new trend and soon women were being attacked or even arrested for appearing in public wearing Bloomers - Munford argued that the garment acted as a political statement by threatening the trousers’ established male identity. The press described ‘Bloomerism’ as spreading across London like a sickness and soon launched a smear campaign against the garment through satirical cartoons and defamatory articles. The notion of women in trousers quickly became unjustly linked with ideas of sexual impropriety, ‘unnatural’ behaviour and women of loose morals.’ Munford argued that through the appropriation of a visual symbol of male power, a kind of role reversal occurred where the male viewer adopted the very behaviour they accused women of having - of being hysterical, having weak nerves, and succumbing to feminine frailties when their world-view was threatened by the sight of the trousered female body. Munford then talked about the Women In Trousers Archive, which she first started in 2017. The archive contains images from roughly 1850-1960. It covers the journey of society’s relationship to dress and trousers and how this intersects with cultural change and ideas of gender. The archive is divided into categories, one of which is a section on Bloomers and reform dress, as well as cycling outfits, work dress and trousers worn by celebrities and Hollywood stars. There is also a submission section, where anyone can submit their photographs of women in trousers, as well as personal anecdotes and memories. The archive is ongoing, and serves to document a hidden history where women wore the trousers. The final talk of the morning was given by Amy Towle, Assistant Exhibitions Officer at Cosprop. Amy spoke about the WSPU and the politicisation of dress in her talk 'Satorial Affront: How the Suffragettes Appropriated Fashion for their Political Agenda’. Amy began her talk by describing her experience at the Women's March in London. When a photograph of Towle and two colleagues dressed as suffragettes with a very memorable placard went viral they became internet sensations around the world. The main focus of Amy's talk was on how the suffragettes used fashion as a tool in their fight for the vote. The WSPU uniform of purple, white and green helped to create unity amongst the women and how this focus on presentation actually drew women to join the cause. By wearing elegant clothes, suffragettes were able to fight back against the anti-suffrage representations that depicted them as ugly and plainly dressed. The WSPU also used the media to further their cause. One way in which they did this was by instructing suffragettes to remain elegant when being arrested in case they were photographed! This focus on fashion by the suffragettes was in contrast to the prevailing belief of the time that viewed an interest in clothing as trivial. Women were accused of lacking an interest in anything else but fashion, yet the WSPU still encouraged women to dress neatly and business-like in order to be inconspicuous. Hobble skirts were condemned by the suffragettes as irrational and obscuring hats and trailing skirts were disapproved of and banned from being worn at the Women's March. Weekly fashion columns were featured in the Votes for Women magazine between 1908-11. The magazine also carried advertisements from department stores, such as Selfridges and Libertys, who sold items in the suffragette colours. Amy finished her talk by discussing the career of Amy Kotze, the suffragette dressmaker who provided a stall of dresses and coats at the May 1909 Women's Exhibition. Kotze grew up in South Africa and was brought to England to seek medical treatment for blindness she suffered as a child. One of Kotze's earliest jobs was drawing designs for embroidery at Libertys before she started her own line of Aesthetic-style clothes. Her designs were advertised in Votes for Women magazine and Kotze famously made a dress for Mrs. Pankhurst, but her trade ended after the First World War. Kotze then opened a gallery selling Murano glass necklaces and also partook in interior design. Amy Kotze signed her dresses 'AK' so get checking your collections in case you have an extremely rare example of suffrage dressmaking!